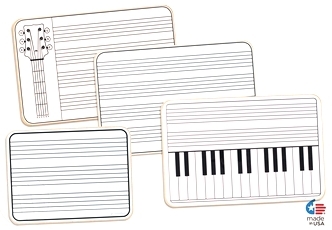 Our individual student lap boards with music themed prints including music staff lines, piano keyboards and guitar frets all made in the U.S.A. are some of the most popular products in our entire line of printed dry erase options. All of our hand held music lap boards are manufactured in the U.S.A. in our factory so we control the quality from start to finish. 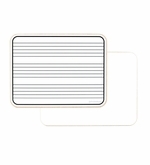 We use our popular 9x12 and 12x18 white student lap boards and using the Opti-Print™ method we apply our prints to the back side of the board. 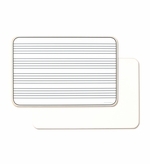 This leaves you with the other side in it's original plain white dry erase format making every board double sided. 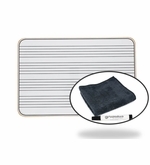 In addition to individual lap boards we also offer complete classroom kits that come with Opti-Wipe™ micro-fiber wipers and black fine point markers so you open the box and get to work. Nothing else to buy and when you're done simply clean off the boards and put everything back in the box. 9x12 Double sided. Music staff on one side and plain white on the other. 12 Music Staff Lap Boards, Markers, Marker Clips and Wipers. 12" x 18" Double Sided. Music staff on one side and white on the other. 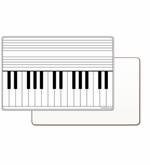 12" x 18" Double Sided Lapboards with music staff and a piano keyboard imprint on one side and plain white on the other. 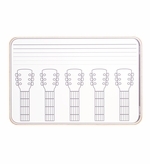 12" x 18" Double Sided Guitar Fret & Music staff lines printed on one side - plain white on the other.